Right now, we are beginning to plan our programs and services for the new home of a larger Roosevelt Island Library at 504 Main Street. We truly value your opinion — and here is a chance to have a say in our plans! Please go to the following website to take a quick survey and help shape our neighborhood library: https://www.surveymonkey.com/s/NFLVWMW. 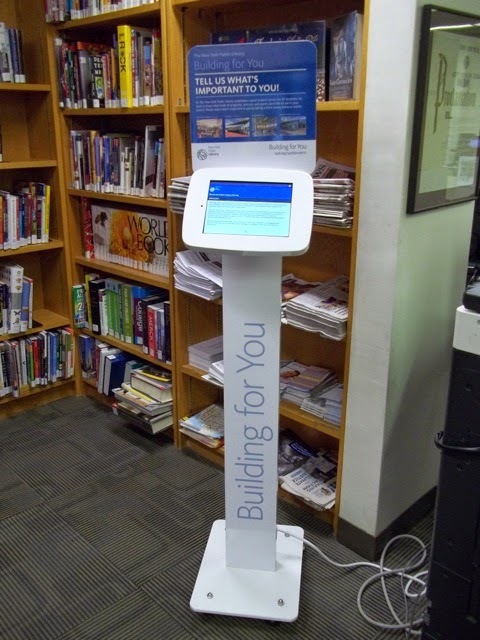 You can also take the survey at the library using the new Building For You Kiosk located near the information desk. This is an exciting time to be part of Roosevelt Island. We have new apartments being built, a revitalized Main Street commercial corridor, the recent opening of Four Freedoms Park, and the arrival of Cornell Tech's new Roosevelt Island campus. Your input is key in making Roosevelt Island Library a part of our community's bright future, and helping ensure that our branch serves everyone: book lovers, adult learners, teens, families, students, small-business owners, writers, creators, and anyone else who comes through our doors. The New York Public Library spent a century building a network of 88 neighborhood and four research libraries in the Bronx, Manhattan, and Staten Island. We've spent $250 million over the past 10 years to improve libraries across our system. Moving the Roosevelt Island Library to a larger space is one of many projects that will help give New Yorkers the libraries they deserve. Your feedback is essential for all of our plans. To get it right, we've been talking to community leaders, recently hosted a community conversation — and now, we're conducting a survey of our users. 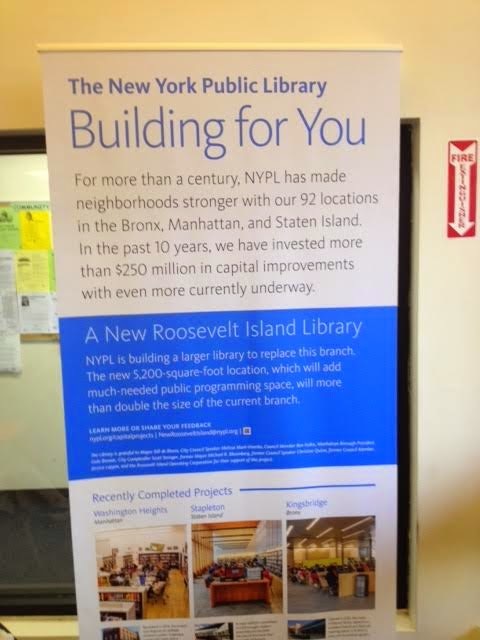 Please take the survey by January 31, 2015 at the branch and help shape our plans for the Roosevelt Island Library. Thank you for helping to guide our future. You are helping us achieve our mission of inspiring lifelong learning, advancing knowledge, and strengthening our communities. Click here to take the survey or go to the branch kiosk and let the NY Public Library know what you would like to see at the new Roosevelt Island Library. Click here for the video of entire meeting. Drop by this informative workshop to explore your Medicare Advantage, Medicare Supplement and Part D Coverage Choices. Allan Katz will be available to answer your tax questions and provide insights into tax preparation, amended returns and tax planning considerations. Allan Katz is the owner of Comprehensive Wealth Management Group, LLC. Allan is very involved in the local community, both on a professional and personal level. Allan is a member of the New York Chapter of the Financial Planning Association, where he does extensive work with the Pro Bono program, the FPA's Mentoring Program and MoneyWorks Program. We will discuss "Something Wicked This Way Comes" by Ray Bradbury. The Science Fiction Book Discussion meets on the first Tuesday of each month. "We Are New York" is an Emmy Award-winning half hour TV show created to help people practice English. Each story is about everyday situations, like going to the doctor or talking to your child's teacher. The characters speak slowly and clearly. Intermediate Level English for Speakers of Other Languages (ESOL) learners will have the opportunity to learn English by watching "We Are New York" videos. Come to the library and meet other people who are practicing English, just like you. This program works best for people who speak a little English already and want to practice. Make a garland of hearts to decorate your home for Valentine's Day. Space and materials are limited and will be available on a first-come, first-served basis. Come and listen to stories presented by performer Regina Ress. It's time to celebrate the Lunar New Year! Beginning on February 19th, it will be the Year of the Sheep. Let's make three-dimensional sheep with paper, glue, cotton balls, and wiggle eyes! Space and materials are limited and will be available on a first-come, first-served basis. We will discuss "Button, Button: Uncanny Stories" by Richard Matheson. The Science Fiction Book Discussion meets on the first Tuesday of each month. 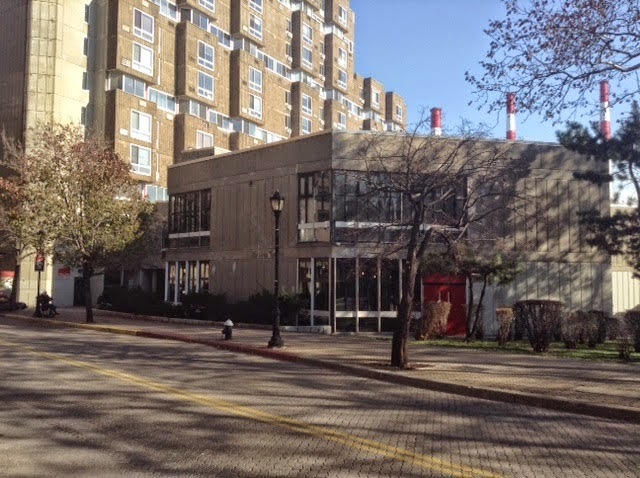 More upcoming NYPL Roosevelt Island branch events here.